Instant white effect after application - is it possible? Yes, it is. Allele White is a revolutionary skin whitening system that allows you to have a whiter and flawless skin in just 1 application plus helps you to continually whitens, improves tone and texture of skin with consistent regular use. Allele White is based on the word Allele ('a, leel). Allele pertains to one of two or more versions of the human gene, and Allele carries the genetic codes which gives us our distinct characteristics passed on our parents to us and to us to our offspring. There are specific Allele for different eye color, hair color and skin color. An instant whitening body cream was introduced to Allele White founder and CEO, Isabel Molina in 2006. In 2012, Isabel wanted to make a formula better and easier to use. She worked with her formulators to perfect what is now known as Allele White - launched just this year 2015. Instant White - Achieve an instant white on your skin which can last up to 12 hours. Lightens skin complexion - They selected powerful lightening extracts found in nature such as Papaya extract; to dramatically improve tone, color and texture of your skin, giving you a vibrant complexion. Moisturizes skin - Allele White contains Dimethicone which acts as skin protectant and emollient, leaving your skin soft and moisturized. Vitamin C - A powerful antioxidant which helps lighten skin, improve skin tone and delay the process of aging-promotes collagen ormation. Sun Protection Factor (SPF 35) - Be white and be protected from the sun. Titanium dioxide acts as a lightening agent and sunscreen, preventing sun damage that can darken your skin. Squeeze out ample amount of lotion onto the palm. Using your fingertips, dab all over desired area to lighten. 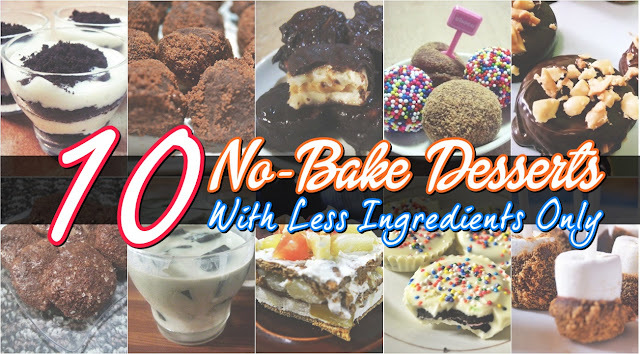 Spread evenly until it blends with your skin. 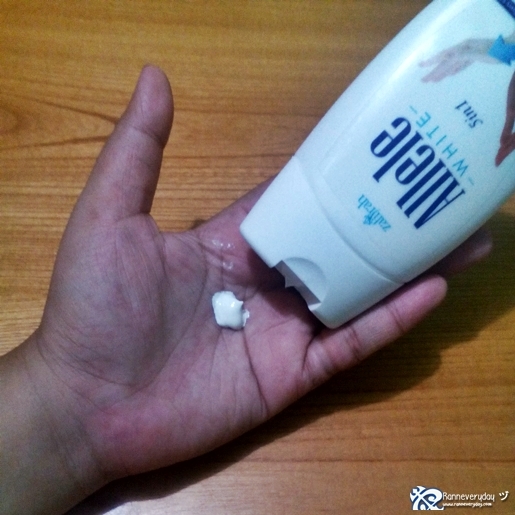 Squeeze out small amount of lotion into the palm. Close the palm and squeeze the lotion. With your hand, dab onto the desired area. 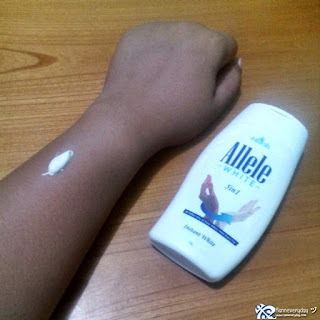 It helps me to have that 'Instant White Skin' factor - I used Allele White lotion and gave my skin an instant white effect. To help you how does it looks on my skin, I applied the lotion on my right arm and compared it to my left arm with no lotion in it. 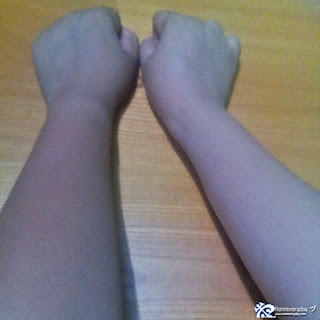 Since my skin color is tan, the instant white effect is more visible on my skin. The instant white however, last only for an hour for me. I guess it depends on your skin type. Isabel Molina, Founder and CEO of Allele White also tried the product. Her right arm with no lotion vs. her left arm with Allele White lotion. It has no sticky feeling when applied on the skin - I am not really fond of putting lotion on my skin since it makes me feel so sticky and since I sweat a lot because I go to gym and going to events most of the time, applying lotion makes me feel uncomfortable. Allele lotion didn't give that sticky feeling when used. It has a lasting aromatic smell - I've been monitoring on how the smell will last for me. It can last up to half a day on my skin plus it smells really nice unlike others which smells like some chemical brands. If you plan on wearing dark colored clothing, be sure to apply Allele White and allow it to dry up to for a few minutes before putting on your dress, to make sure you will not get white patches on your clothing. If you happen to get some lotion on the fabric of your dress, just simply dampen a towel with water and it easily rubs off. I get white stains on the handles of my leather bags. Use twillies to cover the handle of your designer bags, to prevent direct contact with the lotion. Make sure to wipe your palm of excess lotion to prevent white stains on the things you touch. 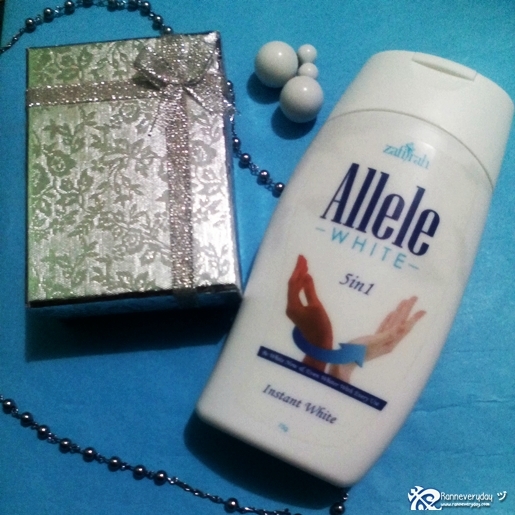 Allele White is available thru Lazada for only Php 185.00. You can also purchase Allele White thru their website for Php 99.00 + shipping fee of Php 110.00. For instant whitening and also helps you to achieve a flawless and whiter skin with continue use, Allele White Instant Whitening Lotion is one of the products that I recommend to try. 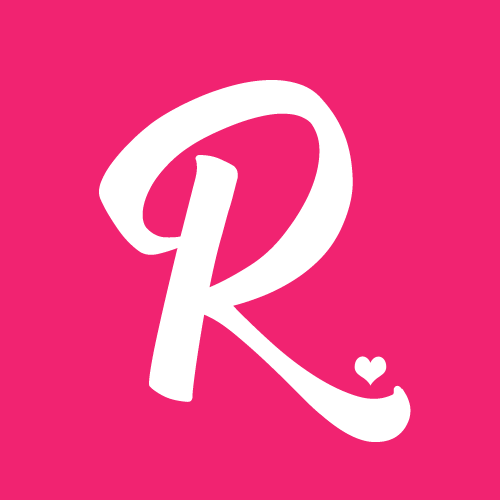 Aside from being effective, you are also giving your support to our local beauty product industry.